This is a message to all Imperial forces garrisoned around the Eurydice Sector. We are the Angels Revenant, former wardens of the Orpheus Sector. We are returned from death. For too many years our crusade to cleanse the galaxy of the God-Emperors enemies have kept us away, blind to the devastation that occurred here, not knowing of the fate our brothers suffered at the hands of the filthy Xenos. No longer. 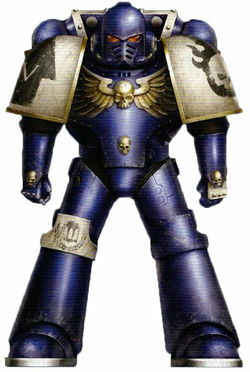 With Fire and Faith we will cleanse these blighted worlds as our Honoured Dead once did, and return them to the light of the God-Emperor. We will avenge our brothers, our homeworld, and our make right that which we failed to do. Our wardship starts anew. We will burn out the cold hearts of the soulless machines, and scour clean any trace of our enemies, whether Herectic, Xenos or otherwise! Orpheus will be reclaimed!! Do not get in our way. The Angels Revenant are a bit of a passion project of mine, first mentioned in IA12, their homeworld of Libethra and its chapter keep was utterly destroyed by the Maynarkh dynasty of the Necrons, a particularly twisted and evil dynasty. The Angels Revenant put up such a fierce fight in the defence of Libethra, that the Necrons had to release the molten core of the planet on them, destroying those on the planet utterly and drowning them in a sea of ash and fire. Badass, right? Cant kill the marines, so we will kill the planet they stand on instead! They view the Emperor as a God, and are fierce supporters of both the Imperial Creed and the Ecclesiarchy. So with that in mind, I set about crafting (in my head, and with the help of a couple friends) a theme to the Angels Revenant. I reckoned that they would utilise an-above average amount of Chaplains, due to the double duties of administering to the faithful, they would also have to make sure the stories of the dead are told, and that those who take their place and take up the deceased brothers arms and armour would take care to remember the spirits of the deceased and honour them. Along with this, I figure they would use plenty of dreadnoughts, those who have passed into death and returned from it would be very well respected in a chapter like this. 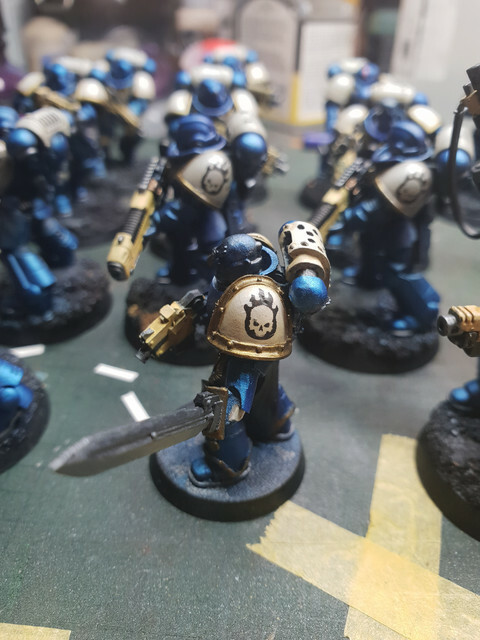 Lastly, the chapter doesnt follow the standard codex way of marking different companies, and that they perhaps are united within a single "brotherhood", as this would also unify the current marines with the dead ones, keeping them closer spiritually. Each marine within the chapter knows the armour of another, due to its ancient nature and the histories of those who wore it. They also have a core of MkIV suits, and its fair to assume they maybe also have a good amount of crusade-ear arms and armours to go with it! I was gonna work my photoshop-fu and design the chapter symbol myself, but a quick search of the B&C library resulted in some being made already! Score! So with these done and the oil wash added (pics to follow of that) I was bored and needed something else to do: cue chaplain number 1. Really super pleased with this one! 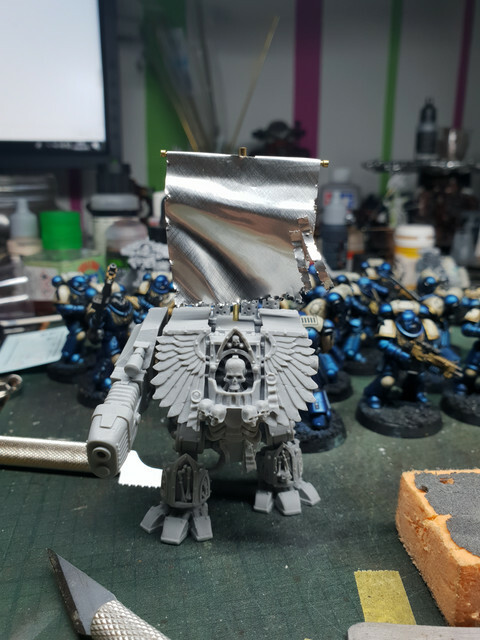 Had a Sevatar I got in a trade ages ago, and he was sitting doing nothing, so decided to rededicate and bring him back to the light of the Emperor, 10,000 years later! His "Crozius" is made from St Marduks blessed staff, “Ferulyx” recovered from the devastation of Colskath, and fashioned into a Holy weapon of redemption, it is said that the charred bones of St Marduk himself reside within the head of the weapon, his spirit bringing blessed ruin to the Emperors foes long after his Martyrdom. There is also a 360 video on my Instagram, the link for which is in my signature. Up next on the painting/converting table is some more chaplains, and some tanks! As well as getting a couple of mixed armour squads (MkIV and MkVII) assembled. Glad to be back painting again! Faction: Sacred Rose. Iron Warriors. Very nice. I started work on my own Angels Revenant Primaris a little while back but didn't really get very far, so I'll certainly be curious to see where this goes. Formerly Brightstar; now with 100% more open Xenos sympathies. Also heresy. Beautiful work on the models. Is "Magister Mortum" (Master of Death?) the Chapter's own Redeemer of the Lost, i.e., High Warden Osphell counts as Astorath the Grim in-game? His model looks promising; the green stuff additions and other customization are well done. Is "Magister Mortum" (Master of Death?) the Chapter's own Redeemer of the Lost, i.e., High Warden Osphell counts as Astorath the Grim in-game? Thanks! No counts as here, the High Gothic translates to "Master of the Dead", his job is to collate the deeds and achievements of the Angels Revenant who have died, the means of their deaths, and then pass that knowledge on to the next generation. 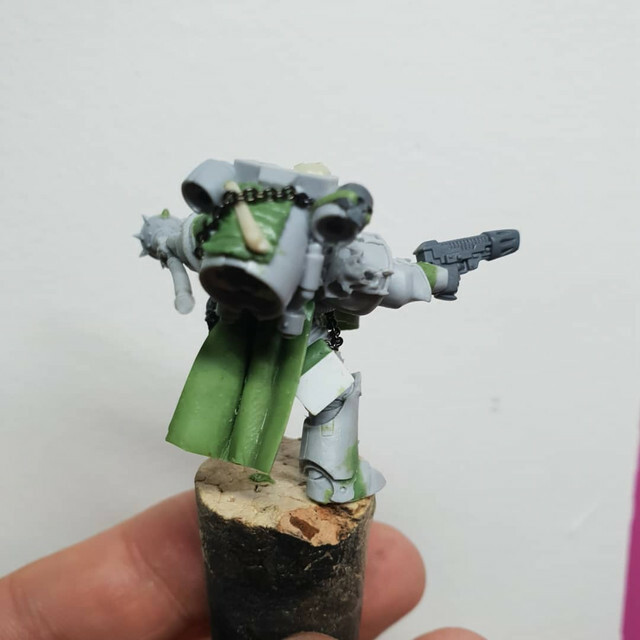 He will just count as a Chaplain with a jump pack in game, he will purely be special to me (although i may homebrew some rules for him!). Gorgeous paint scheme, looks like a promising start to a beautiful army! The Magister Mortum is a very nice build and use of parts; the decals and shoulders look good too. Also been fighting with the old metal venerable dread, quite possibly the worst kit I have ever had to work with!! 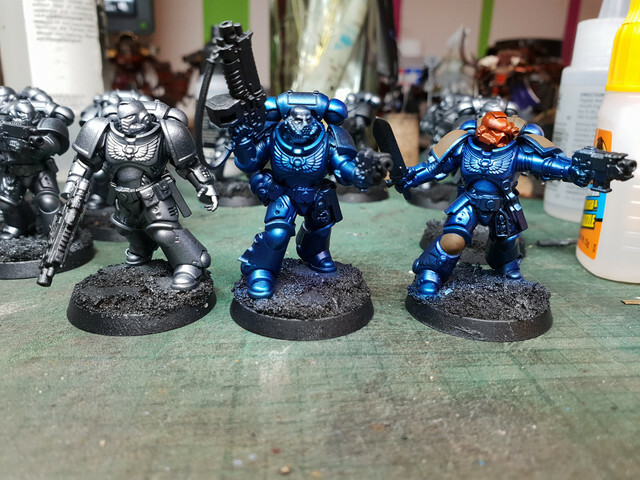 Ready now to start on the Gold for the marines, want to get them 100% finished before moving on to anything else.